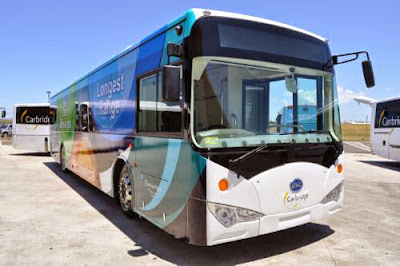 Carbridge Pty Ltd, an Australian airport ground transportation provider, has begun a six-month Electric Bus pilot program at Sydney International Airport. The bus selected for the pilot was made by BYD Company Ltd, which has been recognized over the past few months for its industry leading operational range. The bus will be used as an airport passenger shuttle. At a launch ceremony held at Sydney International Airport, BYD Asia Pacific General Manager Liu Xueliang said, “Compared with fossil-fueled buses, BYD’s pure electric bus has zero emissions, doesn’t make noise and ensures a comfortable ride without disturbances associated with conventional buses of combustion engines. These characteristics will provide a great experience for visitors to the Airport.” Sydney Airport plans to electrify their entire bus fleet in the coming years. BYD’s Battery Electric bus employs many advanced technologies developed in-house by a staff of more than 15,000 R&D engineers, such as the advanced environmentally friendly, BYD Iron-Phosphate battery, in-wheel hub motors and regenerative braking system. The break-through Iron-Phosphate battery is fire-safe and non-toxic: there are no caustic materials contained in the battery, no toxic electrolytes or heavy metals and can be completely recycled. The BYD electric bus delivers a host of operational and environmental benefits for public transport riders, operators and people in the community — it is very quiet and ensures a comfortable ride without vibrations, jerks or noise associated with the conventional buses and combustion engines. The bus can also drive for more than 250 km (155 miles) even in heavy city traffic on a single charge. The bus has completed more than 20 million kilometers of “in revenue service” and has been evaluated in many major cities all over the world.